Douglasville, Georgia – The Cultural Arts Council of Douglasville/Douglas County is excited to be ringing in a new year of art and culture. Coming up next, in celebration of Black History Month, the CAC will showcase artwork from contemporary artists of color in Inspiration during January and February. Gallery admission, tour and reception are always free. Special gallery tours are also available by appointment. Call the CAC at 770.949.2787 or email [email protected] to schedule yours today. Starting in January, Charly Palmer, with other artists that he has mentored, will exhibit artwork in Inspiration, which will be on view from January 10 through February 21, 2019. DC Connection will host the opening reception on Saturday, January 26 from 6 – 8 pm at the CAC. The exhibiting artists will be in attendance to discuss their work. Don’t miss this special chance to meet these visionary artists. This show will feature main curator, Charly Palmer who is a well-known artist and instructor. His artwork has been featured through private and public collections, which include Atlanta Life Insurance, Miller Brewing Company, Coca Cola Company, and Vanderbilt University. The show’s co-curators are Shancheze Johnson and Demetri Burke, both third year Georgia State University students and interns to Charly Palmer. Additional artists featured will be collage artist, Maryam Moma, abstract artist, High off Markers (Jodee), and painter Tim Short. Some of the artwork presented may encourage discussion about identity and history in today’s landscape. 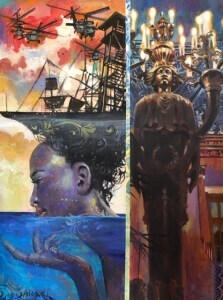 Other works explore the multi-faceted aspects and images for artists of color that want to represent all parts of the globe. Artwork at this exhibit will range from brightly joyous to abstract and sultry, featuring a wide range of unique perspectives and styles. Featuring artists work will be judged for a chance to win the Irma Award. This award is named after Charly Palmer’s mother, who encouraged Charly in following his dreams. The judges will be Ms. Lauren Harris, who is Zucot gallery director. Lauren is an experienced creative professional with a demonstrated history of working in an art-related capacity throughout her career. The second judge will be Mr. George Galbreath, Co–curator of Articulate Atlanta. George has 15 years experience of classroom instruction in the Fulton County School District and has maintained a career as a working artist. The Cultural Arts Council of Douglasville/ Douglas County is located at 8652 Campbellton Street in historic downtown Douglasville, Georgia and is open Monday through Friday, 9 am to 5 pm. For directions and more information, visit www.artsdouglas.org or contact the Cultural Arts Council at 770.949.2787. The mission of the Cultural Arts Council of Douglasville/ Douglas County is to nurture, guide and stimulate the enjoyment of and participation in the arts among Douglas County residents by providing an atmosphere conducive to the arts, broadening the spectrum of quality exhibits and performances available to the community, and fostering individual interactions with the arts through a wide range of satellite groups. The Cultural Arts Council is supported in part by the City of Douglasville and the Douglas County Board of Commissioners.